Facet joint osteophytes result from the breakdown of the protective mechanisms in the apophyseal structures. Osteophytes are a primary cause of facet syndrome, although they are certainly not the only possible source. We have previously written about osteophytes in the zygapophyseal structures in part 1 of this essay, titled facet joint bone spurs. That treatise defines and explains bone spurs, details their locations and expounds on their formation. This is the second part of our coverage of facet joint spurring and in this guide, we take a more detailed look at how osteophytes generate pain. We present 3 distinct circumstances for symptomatic origin in this essay, separated into 2 mechanisms of action: mechanical dysfunction and neurological compression. If you want to further your knowledge of osteophytes in, on and around the facet joints, then this article is perfectly geared for your research needs. Mechanical facet joint pain is defined as symptomatic activity that is created by the movement of anatomical parts. Mechanical pain is certainly the most common variety of symptomology associated with most cases of facet joint syndrome and can be witnessed constantly in clinical practice. 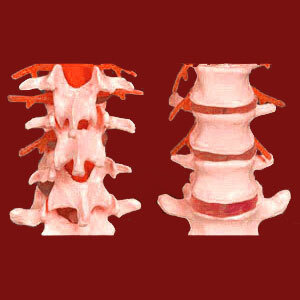 Patients complain of pain upon movement of certain regions of their spine. This pain ranges from minor to extreme, but can easily be narrowed down to the region of the affected joint through physical exam alone. Of course, this helps guide diagnostic imaging to pinpoint the exact location of the problematic facet joint(s). Bone spurs can grow in areas of the facet joint where the 2 vertebral surfaces meet. In part 1 of this essay, we explained how various spinal degenerative processes, including disc desiccation and arthritic accumulation, cause osteophytes to grow. When these spurs grow on the regions of the joint that must move against one another, the bone spurs can actually prevent proper joint movement or may simply create some variable degree of pain when the joint is forced to move. This is the definition of mechanical joint pain. In some cases, bone spurs can literally lock the joint open, closed or in some position in between. If left in this state, the joint can shrink and demonstrate a persistent state of hypomobility. This occurrence can cause serious functional impairment and pain. It might also lead to facet joint fracture in extreme cases. To summarize, visualize 2 very hard, smooth and protected surfaces being well lubricated and moving against one another. This is the way a healthy facet joint works. However, when the surfaces lose their lubrication and protective coatings and begin to hit each other directly, pitting occurs and debris is released. The continuous damage can cause bumps and ridges to form from displaced particles, both free and attached to each surface. If these growths get large enough, they can prevent the surfaces from interacting as designed and might completely stop the surfaces from meeting at all if the debris blocks the path of movement. This is what happens with osteophyte growth in particular areas of the facet joints. In true facet syndrome diagnoses, osteophytes within the zygapophyseal joints can impinge on the small nerves that innervate the joint. These nerves are really very small, but can still cause mild to moderate localized pain, especially upon joint mobilization. This type of symptomology is the one that responds best to facet joint injections, which can often provide complete, but temporary, relief. Facet joint osteophytes can also protrude out of the joint or form on the outside of the joint completely. When these form on the posterior border of the neuroforamen, they can reduce the patency of the opening and possibly compress the exiting nerve root. Facet osteophytes will rarely cause this scenario to exist alone, but can contribute to foraminal narrowing along with other factors, such as ligamentous ossification and hypertrophy, general spinal osteoarthritis, disc desiccation and various intervertebral disc herniation types, such as paramedial, foraminal and extraforaminal varieties. It should be mentioned that although the offending osteophytes might originate on or near the facet joints, the proper diagnosis for this condition is compressive neuropathy and not facet syndrome. Between part 1 and part 2 of this dialog, you now have a complete picture of how bone spurs factor into facet joint syndrome and other types of facet joint-related pain conditions. To learn more about how multiple osteophytes can truly change the entire structure and function of the apophyseal joints of the spine, please move on to read our dissertation covering facet joint hypertrophy.